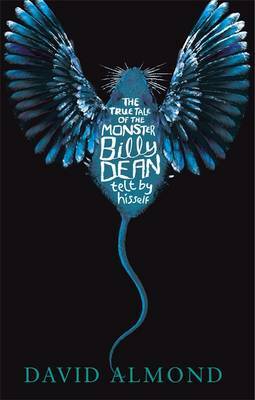 The True Tale of the Monster Billy Dean (hereafter ‘TTMBD’) is David Almond’s first foray into adult fiction. Sitting firmly in Almond’s narratorial comfort zone, TTMBD has a child narrator (the eponymous Billy) who speaks in the first-person past tense, albeit with occasional and somewhat baffling switches of register into the third-person. My theory is that these deviations are to instil a sense of myth and otherness into the book’s more supernatural moments; or maybe it’s a post-traumatic attempt by our narrator to dissociate himself from the horrific experiences of his childhood; ‘he’ functions as a distancing device by not having quite the same psychological resonances as the more direct pronoun ‘I’. It’s a neat idea, but sometimes the transition between registers can be abrupt, which makes the referent of any given sentence unclear, hence making re-reading an occasional necessity. But principally the child narrator offers a good narrative facility for exposition; Billy describes the world around him in such intricate detail because he, like the reader, is experiencing it for the first time. TTMBD is set in an alter/future version of Scotland, in a town reduced to rubble by some un-disclosed cataclysm. Billy lives with his mother and has never left the tiny, dilapidated flat he was born in; never left it, that is… until now! Once outside, Billy slowly integrates with the town’s blighted but nonetheless highly religious population, and is immediately heralded as the Angel Child, the ostensible deliverer miraculously sent to ease the pain of those living in this hellish dystopia. While colloquial dialect is common enough in modern literature (Trainspotting etc. ), this phonetic approach is less-so: most recently, Iain M. Banks’ culture novels. TTMBD is visually reminiscent of Banks’ smash sci-fi novel of a few years ago Feersym Endjinn. What’s more, Almond’s approach to phonetics is noticeably less consistent/adept than Banks’. Billy will sometimes replace the hard-vowel ‘i’ with the reduced-vowel ‘y’ (such as ‘like’ becoming ‘lyke’) for example, but in other instances the exact same phonic sound (‘phoneme’) will be represented differently (‘right’ becoming ‘rite’). This is an incredibly minor niggle, but surely a narrator whose experience of language was entirely non-textual would always use the same letter to represent the same sounds, instead of the divergent and more advanced schema we have here? The other like-it-or-loathe-it feature of the narration is the explicitly saccharine sentimentality that colours the book’s tone. Constant affirmations of Billy’s love for his beautiful mother are initially charming, but soon lose all emotional poignancy through their persistent repetition. In fact, a somewhat heavy-handed approach is, in my eyes, TTMBD’s biggest failing. I was initially intrigued by the tentative is-he-isn’t-he nature of Billy’s miraculous acts, which could just as easily be explained as psychosomatic wish-fulfilment as actual divine event. But the literal nature of Billy’s gifts soon becomes apparent, and concordantly my interest waned: the unknowability, the doubling, the guarded uncertainty of the miraculous was what piqued my curiosity – once this veil is lifted, there’s nothing left to wonder. Likewise the book’s dénouement is excruciatingly predictable; so much so, in fact, that I began to think I was falling for a massive narrative red-herring, which would at least have been an amusing caveat; but this only made the predictable ending that much more of a let-down. Ironically, then, my final frustration is with the several too-vague aspects of the narrative, notably the never-explained nature of the apocalypse. In this regard, the book draws heavily from another modern masterpiece, The Road by Cormac McCarthy: the parent and child struggling to survive in a non-disclosed eschatological landscape is a narrative similarity which demands comparison – but Almond is no McCarthy, both in the depth of his ideas and the poetry of his prose. Whereas The Road uses this ambiguous setting to examine fundamental aspects of the parental relationship and the propensity of humanity to cause, endure and extirpate tragedy, TTMDB merely uses the vague to suggest a profundity which I just couldn’t find. The True Tale of the Monster Billy Dean’s not an unmitigated failure: the desolate, grey landscape of ruin is drawn beautifully, and many of the book’s grotesque moments wouldn’t be out-of-place in a good horror novel (for e.g. Billy’s surgical experiments to synthesize a bird-mouse); likewise many of the metaphors are both aesthetically and conceptually pleasing: such as the ritual vignette of Billy mixing his blood with ink, which not only highlights his fundamental need to textually chronicle his own life, but also offers a powerful visual analogy for the potentiality of the written word to perform miracles and liberate the destitute – ink being here a symbolic replacement for the blood of Christ. But it’s the familiar nature of the story that lets this book down; to me, other writers have done the same things better. If you can’t be arsed to read Feersum Endjinn and The Road, and Riddley Walker then read this instead: but The True Tale of the Monster Billy Dean is less than the sum of its parts – I recommend you read the former, and give this one a miss. This entry was posted in Novels, Reviews and tagged David Almond, The True Tale of the Monster Billy Dean.. Bookmark the permalink. I’ve only skimmed through your write-up as I just started to read this book this morning and didn’t want to be too influenced by it. A couple of things leapt out at me though – re the pidgin/dialect language – I find there are some books where it totally works for me (the wonderful Riddley Walker, and Sam Taylor’s The Island at the End of the World), and others where it doesnt’ (Trainspotting and Feersum Endjinn – sorry). Can’t work out why – I wonder which this will fall into? Would love to know your final thoughts when you’ve finished it. Please let me know when you’re done. As always, many thanks for reading (well, skimming, in this case 😛 and commenting), I don’t get many readers; so I’m flattered that you’d take the time to comment here. As an aside – perhaps I wasn’t very eloquent in my review – this isn’t written in any dialect; it’s not accented or a regional form (as far as I can tell), it’s purely a phonetic visual representation of RP, peppered with very occasional colloquialism. As I say in my review, it’s one of those like-it-or-loathe it idiosyncrasies. I’ve noticed! Am a few chapters in, and I feel it may wear on me. You’re right the phonetic spellings are a bit hit and miss, and some words left unaltered I was surprised not to see spelled differently. Yet to get into the story properly yet though. Well I think I will avoid this one I have to say. Its interesting that so many novels are doing this ‘dialect’ of ‘phonetic’ thing at the moment along with the trend in child narrators, though I guess really the two go hand in hand. I have not long read Pigeon English by Stephen Kelman, which was good in parts, but sort of not in many too. It wasnt original and I wanted more. Myself and the lovely Naomi Wood are discussing it on Savidge Reads (blatant hint ha) and the narrative is one of the things we both loved about the book yet I also felt it let it down somewhat, over simplified it and took away the power. Hi Simon, Many thanks for reading and commenting on my blog – it means a lot. If you’ve read ‘Riddley Walker’ and ‘The Road’, (which I imagine you have), then you won’t find anything new in this book. So yeah, I’d give it a miss if I were you. Many thanks for the heads-up re: your discussion, I’ll head over to Savidgereads and check it out right away!